What is garage door insulation and why is it important? Insulation and the steel gauge of an overhead door is important. If you plan on spending a lot of time in your garage, have a room above or adjacent to your garage, or have a lot of activity, such as children playing in front of the doors, then you want to consider the R-Value and the thickness of the steel. R-Value is a measurement of thermal efficiency of a door. The higher the R-Value the better insulated the door. If there is the chance of basketballs hitting the outside of the door, you need to consider a heavier gauge steel, such as a 24 gauge. Remember, the lower the number, the stronger the steel. Insulation is material that has the ability to reduce heat or cold transmission. Amount of heat necessary to raise the temperature of one pound of water one degree Fahrenheit. Ability of a material to retard the transmission of heat. The higher the R-Value, the better the insulating performance. Amount of heat, in BTU, transmitted through one square foot of material (the door) in one hour at a temperature difference of one degree Fahrenheit from one side to the other. The lower the U-value, the better the insulation. 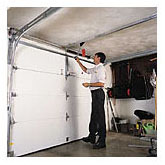 Is the garage door designed to prevent personal injury or property damage if the spring breaks? All Clopay extension springs incorporate an exclusive safety containment cable that prevents a snapping spring from flying free and causing injury or damage. On all Clopay torsion spring garage doors, the spring is installed around the torsion shaft so that, if a spring should break, it cannot snap free and cause damage or injury. Are you able to loosen the bottom brackets of the garage door? Conventional garage door bottom brackets are under extreme tension and can cause serious injury if deliberately or accidentally loosened or removed by someone inexperienced in garage door installation or maintenance. Clopay residential steel garage doors feature our patented Safe-T-Bracket® which, under normal circumstances, cannot be removed while the door is under tension, significantly reducing the risk of serious injury. Have you checked the spring on your garage doors? Eventually, all springs will wear out and break, even high quality steel springs like the ones used by Clopay. If you have an older garage door, have a garage door installation professional inspect and replace the springs if necessary. 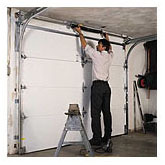 If your garage door has two springs, replace both at the same time, even if one is not broken. This will prevent any damage caused if the second spring breaks, and also keep your door working efficiently. Are there any frayed or worn strips hanging loose on your garage door's spring system? If the cables that attach from the spring system to the bottom bracket on either side of your garage door are frayed or have worn strips hanging loose, your cables are in danger of breaking. This could cause serious injury or property damage. Have the cables inspected immediately by a garage door repair professional. Is it a safety concern if the springs are noisy? Sometimes older garage door springs become squeaky or make a chattering noise. The noise is caused by the spring coils rubbing against one another. This is not a safety concern and can be corrected with a spray-on lubricant. Are the services of a garage door installation professional required for standard torsion spring door installation? Manual winding of a torsion spring during garage door installation or adjustment is extremely difficult and potentially dangerous. Until recently, torsion spring garage doors could be safely installed only by a garage door professional. With Clopay's patented EZ-SET® Torsion Spring System now even do-it-yourselfers can safely and easily install or make adjustments to torsion sprung garage doors using a 3/8" power drill. If your torsion sprung door does not feature Clopay's EZ-SET Torsion Spring System, contact a garage door repair professional to make adjustments or repairs. Does your garage door opener have a reversing mechanism and does it work properly? A faulty reversing mechanism on your garage door opener could cause damage to your car or even injure a child or pet that inadvertently gets caught in the path of the closing door. All automatic garage door openers manufactured and installed after 1991 are required by law to have a reversing mechanism. We recommend that you have your garage door opener professionally installed, and check it periodically to ensure that the reversing mechanism is working properly. Reversing mechanisms activated by contact can prevent most potential damage or injuries caused by a garage door closing automatically. "Photo eyes" offer an added safeguard, but can easily become disabled if bumped or jarred in any way. 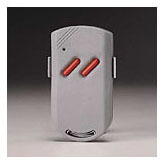 Required on all garage door openers manufactured and installed after 1993, photo eyes are connected to the bottom of the track and reverse the door when an infrared beam is broken. Safety is improved because nothing actually has to make contact with the door before it reverses. Is the wall control panel mounted at least five feet above the floor? 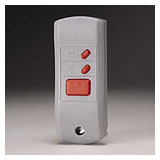 Accidents can occur when children play with the wall control panels for an automatic garage door opener. We recommend mounting your wall control panel at least five feet above the floor, out of the reach of young children. Remind your children not to play with the controls. Are the garage door remotes out of the reach of children? Accidents can occur when children play with the remote controls for an automatic garage door opener. Keep your remotes out of the reach of children and educate your children about the potential dangers associated with these mechanisms and the garage doors they operate. Does the opener have rolling access code technology? Many homes have been burglarized by thieves using universal controls that open the garage door by reading the access code in the opener. Rolling access code technology is one way to protect your home, family and belongings against thieves and intruders. Rolling access code technology changes the code of your automatic opener after every use, so the thieves' universal controls are rendered useless. Is the garage door opener system properly attached to your garage door? Be sure your opener is attached to your door with an opener reinforcement bracket. Failure to properly install this will cause damage to your garage door and will void the manufacturer's warranty. Be sure you have the proper configuration for your garage door model and size. Refer to the installation manual for specific instructions. Can I install my garage door? A "do-it-yourselfer" can install a garage door, if he has skills and tools to do so -- and, most important, if he has carefully and thoroughly read the installation instructions before beginning the job. However, many do-it-yourselfers attempt garage door installation without fully understanding the scope of the project. Being fully informed about garage door installation prior to beginning can help prevent injuries and save considerable time. Remember there will be no access to the garage for up to 8 hours during the installation process, so plan accordingly. We provide complete educational materials, videos and toll-free customer phone support to help you with your installation. Does your door go up and down smoothly when manually operated? A garage door that does not go up and down smoothly when manually operated probably has a spring system that is out of balance, which could cause premature wear and tear on your garage door's hardware (including the rollers and hinges). Depending on how worn the spring is, it may need to be adjusted or replaced. For greater safety and operating performance, we recommend calling a trained Clopay garage door service professional. Your garage door is probably the hardest working part on your home, being raisesd and lowered an average of six times per day. Over time, parts can wear out and break, creating potential safety problems. Although there are some light maintenance duties and inspections you can perform yourself, we reccomend that you have your garage door professionally inspected annually to maximize the life and safety of your door. At the very least, you should periodically check your rollers, hinges and safety equipment to be sure they are securely fastened and working properly.